Based on unique data on the relative distribution of power within the Russian political elite, we investigate the dynamics of (de)institutionalisation and the onset of personalism in Russian politics. We use quantitative techniques to contribute to the comparative study of democratization and authoritarian reversal. 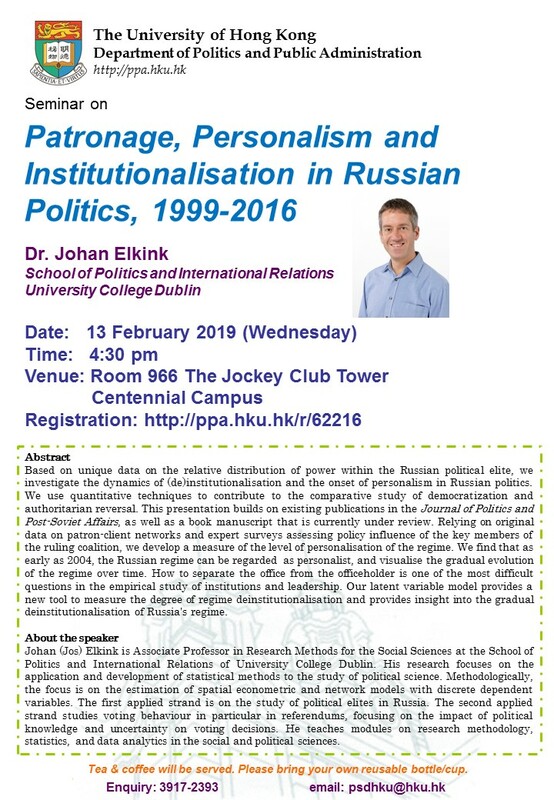 This presentation builds on existing publications in the Journal of Politics and Post-Soviet Affairs, as well as a book manuscript that is currently under review. Relying on original data on patron-client networks and expert surveys assessing policy influence of the key members of the ruling coalition, we develop a measure of the level of personalisation of the regime. We find that as early as 2004, the Russian regime can be regarded as personalist, and visualise the gradual evolution of the regime over time. How to separate the office from the officeholder is one of the most difficult questions in the empirical study of institutions and leadership. Our latent variable model provides a new tool to measure the degree of regime deinstitutionalisation and provides insight into the gradual deinstitutionalisation of Russia's regime. Johan (Jos) Elkink is Associate Professor in Research Methods for the Social Sciences at the School of Politics and International Relations of University College Dublin. His research focuses on the application and development of statistical methods to the study of political science. Methodologically, the focus is on the estimation of spatial econometric and network models with discrete dependent variables. The first applied strand is on the study of political elites in Russia. The second applied strand studies voting behaviour in particular in referendums, focusing on the impact of political knowledge and uncertainty on voting decisions. He teaches modules on research methodology, statistics, and data analytics in the social and political sciences.